Congrats to all the winners, and thanks to everyone who participated. Don’t be disappointed if you didn’t win this time around. I have loads of contests lined up. The next contest should be up in a few days. Subscribe to my RSS Feed or the email newsletter to ensure that you don’t miss out on future giveaways. WoW! Thank you very much for winning. I really appreciate it. Congrats also to Asriel. Thank you Pallab De and TuneUp for the giveaway! Oh My God, I didn’t know what to say..
Thank’s alot Pallab for This Contest.. I really appreciate Your contest on this Lovely website..
Once again Thank’s alot Pallab. May LORD JESUS ALWAYS BLESS You! Congrats to the two winners! TuneUp is a great software! I agree, tuneup looks like wonderful software. Congrats vhick and Asriel. Looks like you’ll have pretty zippy computers now with these utilities! Congrats to the winners. I love contests, but i rarely win them. Congrats to whom, they win. 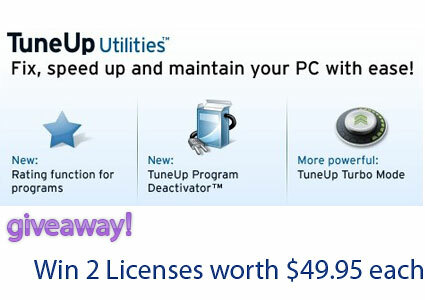 Congratulations to the winners, I hope you hold another contest for TuneUp Utilities in the future.